We are thrilled to announce that Professor David Reinkensmeyer will present the Keynote Lecture at the Irvine Brain Bee on February 16, 2019. Dr. Reinkensmeyer is a Faculty Fellow of the UC Irvine CNLM and a Professor in both the Departments of Mechanical and Aerospace Engineering as well as the Department of Biomedical Engineering. Dr. Reinkensmeyer received his B.S. degree in electrical engineering from the Massachusetts Institute of Technology and his masters and doctoral degrees in electrical engineering from the University of California, Berkeley. He has been a professor at UC Irvine since 1998. 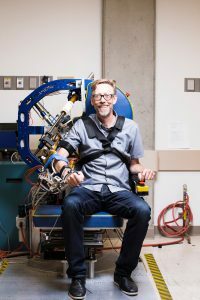 As director of the Biorobotics Laboratory, Dr. Reinkensmeyer aims to develop technologies that, through repetitive training and exercise, enhance human movement, motor learning and rehabilitation, allowing individuals with disabilities to move again. All registered Brain Bee participants and their parents will be invited to attend the Keynote Lecture. To learn more about the 2019 Irvine Brain Bee and to register, click here.